The first thing you need to do is to register so click on Register Free at the top right hand corner of the window. Enter details in all the spaces and then click on Register. Once you have registered, check your email account for a message asking you to confirm your registration and then enter your log in details at the top of the soundsites screen. 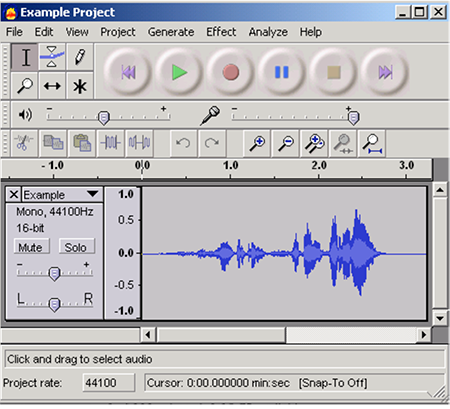 Once you’ve recorded and edited your sound and you are ready to upload it to the sound map, click on Add Sound. You’ll see an icon with the words Drag Me! next to it. Find the location on the map where you recorded the sound by dragging the icon – you can zoom in to get the exact location by clicking on the zoom in/out bar (see left). Once you’ve got the correct position, you can start filling in the sections in the window. Give you sound a name and then click in the Date box to choose the date of the recording; it will automatically show you today, but you can select any day in the past. It is important that you say something about your sound, so let everyone know WHY you recorded the sound and WHAT is interesting about it. Remember that other people will be able to hear this sound and make comments about it, so it’s important that you tell people as much as you can about the sound. Click on Upload and then select the file for uploading. Select Soundsites in the project menu below and then click on Send. Your file has been uploaded. Click on Home and then either zoom into the map to find your sound, or select it from the menu at the top of the screen Click on the icon to access the information window and listen to your sound. If your sound is in the wrong location, you can move it by clicking on Update Sound Position and then moving the icon to the correct location. If you want to delete a sound that you have uploaded, click on Delete Sound and follow the instructions. and the file downloads to your machine. Then you can open the .kml within Google Earth and view it outside the soundsites project. As someone who has uploaded sounds to the site, we want you to spend some time listening to all the other sounds on there and, in particular, commenting on the sounds that you encounter. You can do this using the comment boxes at the bottom of each sound’s window. Press the play button to listen to the file you just imported. Choose a section of the sound file which you don’t want (e.g., chat before the start of a sound) by clicking and dragging to highlight the unwanted section. Press Delete on the keyboard or Edit then Delete in the menu. If a sound file is too loud or quiet in relation to another file, adjust the volume by clicking and dragging the volume bar below. + turns the volume up, – turns the volume down. If you want to Fade in or Fade out sounds to prevent them from coming in or going out too suddenly, highlight the part of the sound file at the beginning you want to fade in and click on Effects then Fade In on the menu bar. This will change the beginning of a file to come in smoothly from no volume rather than coming in suddenly. Similarly, select the part of the sound file you want to fade out and click on Effects then Fade Out on the menu bar. This will change the end of the sound file to go out smoothly. Click on File and then Export As… then choose the .mp3 format, which is best for web use. Choose a place to save the file and click on Save. You will then have a cleaned up file ready to upload to the sound map.